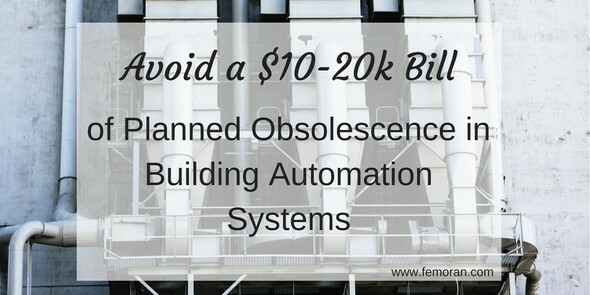 Do you know about planned obsolescence in the building automation world? Yes, companies PLAN to stop supporting your system and you are forced to upgrade. But, we have a secret for you. There's a way out of that. If your property has had a building automation system or BAS for some time now, you may have already experienced this. BAS manufacturers plan out when to stop supporting a product that may still work perfectly. Dan O'Halloran, President of F.E. Moran Mechanical Services has seen it a lot. So much so, he got really sick of it. One of his customers needed their BAS supported and the manufacturer refused. It was time for them to upgrade. Dan was not having that. He sought out a solution and found one: Computrols. Computrols supports their systems forever. Yes, you get a lifetime warranty. Their systems hold up for decades, are American made, and will always be supported. Check out their video for more information. can save properties on utility bills, control utilities from anywhere, and intelligently adjust controls. Find out all nine benefits here.